Pleasant scent and anti-static properties are a nice bonus! The CarPro Eraser Intensive Oil and Polish cleaner is a fantastic cleaner you use on the vehicles exterior to ensure it's completely clean. 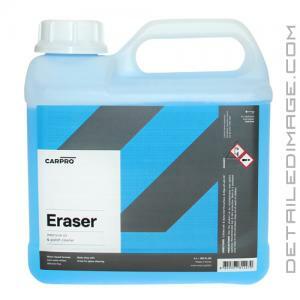 Sometimes a surface can look clean but when you need to be sure the surface is clean the CarPro Eraser is there for you. Virtually every polish leaves behind some ultra fine layer of oil that is almost impossible to see. The surface may also have dust particles, finger prints, polishing particles and other contaminants naturally found in the air settling on the vehicle. These oils and residues can be very challenging to remove even with a top quality microfiber towel. Removing the residue and oils can help increase the durability of a sealant or wax applied afterward. However removing this residue is absolutely critical before applying a product like the CarPro Cquartz Ceramic Quartz Paint Protection. Just mist it on the paint and wipe it away with a clean microfiber towel and you'll see and feel a squeaky clean shine that you can apply any form of protection on top of. The formula contains no silicone and it's body shop safe so use it with no worries. You'll enjoy it's pleasant fresh scent along with it's anti-static properties that help repel dust. 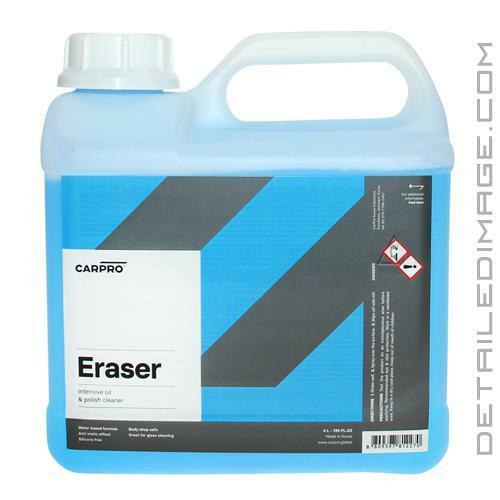 So when you need a cleaner that leaves the surface in pristine condition make sure you pick up the CarPro Eraser. Eraser is a product deigned to remove oils after polishing to give a completely bare surface for sealants, waxes and coatings to adhere to. A diluted solution of IPA, not the beer, will do this as well. HOWEVER, Eraser does it faster, easier, safer and with a much better scent.